The Perth side, who had netted just five goals since the turn of the year, savoured a hat-trick of wins over their local rivals with strikes from former Blackburn youngster Callum Hendry and winger Matty Kennedy. It meant a sixth successive defeat for Dundee, with a home game looming against Aberdeen before the split. Hendry, the 21-year-old son of former Scotland skipper and one-time Dundee defender Colin, celebrated his first appearance of an injury-plagued campaign by opening his league account for the Perth club. And star turn Kennedy killed off the visitors’ hopes of a fightback with a neatly taken second half strike. Dens boss Jim McIntyre made four changes in the wake of a painful 2-1 defeat from St Mirren, with Darren O’Dea, Kenny Miller, Jesse Curran and Paul McGowan starting. Opposite number Tommy Wright turned to Hendry and Ross Callachan after his top-six hopes evaporated with a loss at Motherwell. 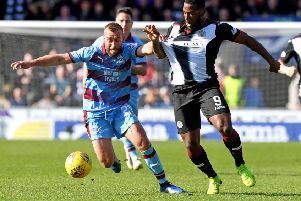 In a lively opening spell St Johnstone centre Chris Kane thought he had bagged a fifth-minute lead when he stabbed home from six yards after goalkeeper Seny Dieng managed to fend off Callachan’s shot. However, the striker had strayed offside and visiting fans breathed a sigh of relief. Zander Clark was forced to parry Miller’s fierce strike and seconds later the veteran centre-forward rounded the goalkeeper but faced a tight angle and his cutback evaded supporting runner Ethan Robson. Having been let off the hook Saints secured a 16th minute advantage in their next attack. Full-back Richard Foster swung over a cross and Hendry’s back post touch reared up off the turf to find the far top corner. Dundee captain Martin Woods let fly from 20 yards on the half-hour mark but Clark dropped to his left to touch a testing snapshot round the post. Minutes after the restart Dundee midfielder Robson wasted a glorious chance to level by side-footing Curran’s cross over the target from six yards. Only a brilliant Dieng save prevented Kennedy’s rising 20-yard effort finding the top corner of the net in the 58th minute. However, the goalkeeper was helpless on the hour mark when Kennedy accelerated past right-back James Horsfield to plant a low shot into the far corner.